How Does The NCAA Men’s Basketball Coaches Poll Stack Up With Ticket Demand? With the release of the 2011-12 NCAA Men’s Basketball coaches poll we thought we would take a look at how tournament favorites are stacking up in terms of ticket demand. Does being a favorite to win it all in March translate to an increase of prices? Highest ticket price? Not too surprising to see that sort of demand for Cameron Indoor Stadium. Even Kentucky has one of the most die-hard fanbases anywhere in the country. But Temple being in the top 10? That has to be a surprise for anyone outside of Philadelphia. Maryland won it all in 2002 but has largely been a disappointment in the final years of the Gary Williams era. The relatively new Comcast Center might deserve more credit than Gary’s recruiting. Georgetown alums like Chad and I are thrilled the Hoyas even made the list. So who are the real underachievers? A lot could be said about North Carolina. The perennial powerhouse has won two national championships in six years, is picked to do so again this season, and only managed the No. 8 spot? Syracuse is also a bit surprising for a school that has such a prominent following. Worse still may be Connecticut, averaging tickets prices of $45.16 and just good enough for No. 28 overall. 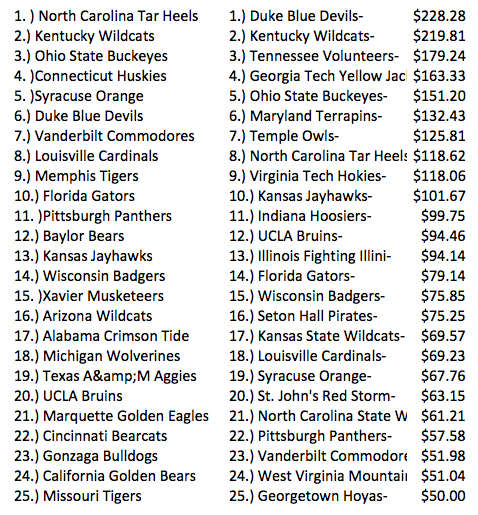 Notre Dame’s recent success doesn’t look to have invigorated that rampant fanbase, as it’s only averaging $41.93. So what do you think? What are you most surprised about? The teams that aren’t doing well but selling like crazy or the one’s not selling as well?